The Salween River holds a unique place among the world’s great rivers, not only due to its vibrant ecosystem and the rich biodiversity that it supports, but also because it remains largely untouched by human interventions, including dams. The majority of the river continues to flow freely. The Salween is home to a large number of diverse ethnic communities. Despite decades of armed conflict and forced displacement, the Salween River has remained a constant home, a source of livelihood, food security, culture and identity for thousands of communities. In March 2017, our photographer made a trip along the Salween River from Karen State (along the border between Thailand and Myanmar) to the remote corner of the Yuam River, a tributary of the Salween River in Mae Hong Son Province, finally traveling upstream to Karenni State, to document sections of this iconic river and the communities and livelihoods at risk due to proposed hydropower projects and water diversions. A cascade of seven dams is planned along the mainstream of the Salween River. Many of the proposed dam sites are in areas of active armed conflict because of ongoing clashes between the Burmese military and ethnic minority forces. The dams threaten the already delicate state of the region, and there is widespread concern about the expected human rights and environmental impacts if the projects move forward. To date, the Kunlong Dam in Northern Shan State and the Mong Ton Dam in Central Shan State are the most advanced. Communities along the length of the river have expressed their strong opposition to hydropower development, and called for the rights of local people to lead decision making over the management of their natural resources and future of their lives. On March 14, Karen ethnic villagers from Thailand and Myanmar joined a cultural event to worship the Salween River on the Thailand-Myanmar border in an Internally Displaced Persons’ camp in Karen state, not far from the proposed Hat Gyi Dam site. Events were held all along the Salween River in honor of the International Day of Action for Rivers in Kachin, Shan, Karenni, Karen and Mon State. The community gave thanks for the river and expressed concerns over the planned cascade of hydropower projects. A representative from Karen Women Organization (KWO) spoke at the International Day of Action for Rivers gathering: "The Salween is home for thousands of refugee," she said. "Hydropower planning needs to take into consideration the human rights impacts of such development projects." Little is known about plans for hydropower development on the Salween River. Communities have received limited information, and have not been consulted about planned construction, which greatly concerns the hundreds of thousands of people who do not know what their future holds. In the dry season, which spans from March to June, serious water shortages are expected in Thailand, especially in the central part of the country where water demand is high. The shortages are the result of expanded plantations, urbanization and industrialization. The Thai government recently initiated a plan the plan to divert water from the Salween River basin. 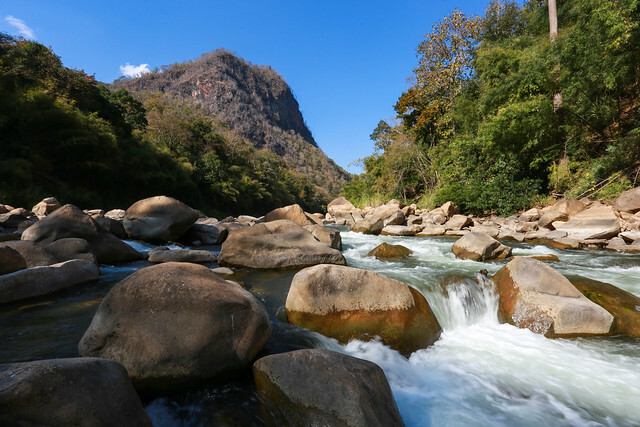 The government has studied 19 options, and it will likely choose the Yuam River – a tributary of the Salween. The plan consists of three major elements: a dam on the Upper Yuam River in Sob Moei District, Mae Hong Son Province; a storage tank on the hill above the confluence of the Ngao and Moei rivers; and a 63 kilometer-long concrete tunnel through the hills to the Ping reservoir (the Bhumibol Dam). Further upstream on the Salween River in Karenni state, the 4,500 MW Ywatith Dam project is planned. It will be approximately 45 kilometers from the Thai border. Here a woman pans for gold in the Salween River, close to the proposed site of the Ywathit Dam in Karenni State. The Karenni Environment Group have reported rampant logging in the area around the Ywathit Dam site. Villagers living in the area have been refugees of war for over 20 years. Many have sought shelter along the Thai border. However there are some villagers who still live around the site of the Ywathit Dam, and who are counted as Internally Displaced Persons. These people are forced into hiding when violence breaks out between the Burmese military and ethnic forces. “Dams will have devastating, irreversible impacts on Burma’s rivers, which are vital arteries for millions of people, nourishing livelihoods and fragile ecosystems – already under threat from climate change and widespread deforestation,” reads a statement released by Burma Rivers Network on March 14, the International Day of Action for Rivers. The statement notes that under Burma's master energy plan, more than 50 dams are planned on Burma's rivers, mostly on the Salween and the Irrawaddy. Three quarters of these projects will export electricity to neighboring countries. The Salween River is an iconic river which provides a lifeline and identity to thousands of people who for decades have been denied their true home and whose lives have been constantly under threat. There is an urgent need for the government of Myanmar, along with foreign investors, to recognize and acknowledge the importance of the Salween River as well as the far-reaching social, environmental, political and economic impacts of planned dams, which cannot be exported or ignored.